The idea behind "Dolcissimo" is to create a synaesthetic product that could be used to highlight the correlation between the many colors of sound and the flavors of chocolates. 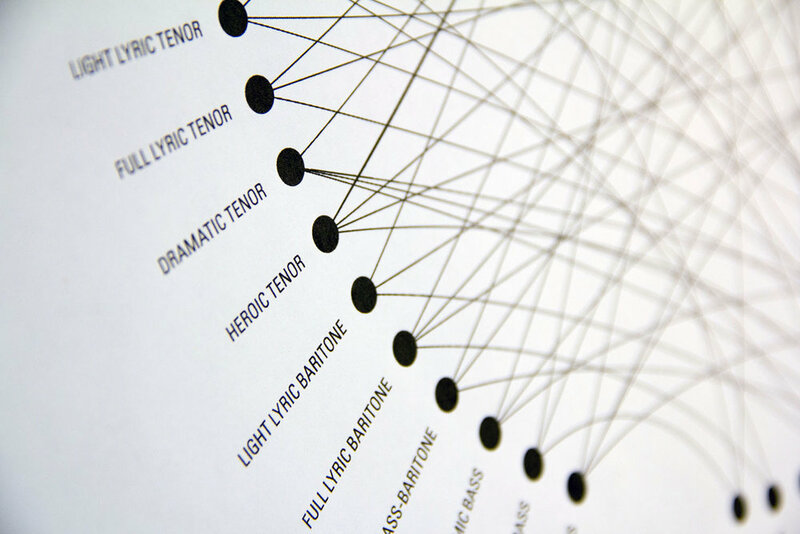 The first step in the process was to visually map out each vocal part as outlined in the Guide to Operatic Roles and Arias by Richard Boldrey. In his book, Boldrey categorized each major vocal part by its "register," "vocal weight," and "timbre." The linework on graph that resulted from classifying the vocal parts became the pattern that was embossed onto the packaging. For each of the 27 vocal categories, I listened to a selection by a performer in that category. From there, I assigned a flavor profile based on the timbre of the voice—taking into consideration the "register" and "vocal weight" as assigned by Boldrey. As the final component of this synesthetic piece, the chocolates themselves were colored to coordinate not only with the flavor profile, but the colors that were inspired by the music. Each package was made by hand—first by gold-foiling the logo onto the brown, texture paper then laser-engraving a masonite plate, which was run through a printmaking press with the paper. This resulted in a deep impression that gave the finished product a bold texture.